Stand upright with your inner feet parallel and about six inches apart. Contract your front thigh muscles to lift your kneecaps. Keeping your legs completely straight, exhale and bend forward from your hip joints, moving your torso and head as one unit. With an inhalation, lift your torso as if you were going to stand up again, straightening your elbows. Lengthen your front torso, and on the next exhale, lift your sitting bones. Depending on your flexibility, your lower back will hollow to a greater or lesser degree. As you do this, release your hamstrings and hollow your lower belly (below your navel) as well, lightly lifting it toward the back of your pelvis. Lift the top of your sternum as high as you can, but take care not to lift your head so far that you compress the back of your neck. Keep your forehead relaxed. For the next few inhalations, lift your torso strongly as you continue to actively contract your front thighs; on each successive exhalation, strongly lift your sitting bones as you consciously relax your hamstrings. As you do this, deepen the hollow in your lower back. 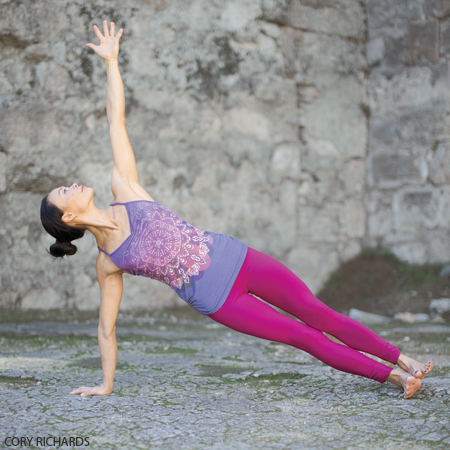 Finally exhale, bend your elbows out to the sides, pull up on your toes, lengthen the front and sides of your torso, and gently lower into the forward bend. If you have very long hamstrings, you can draw your forehead toward your shins. But if your hamstrings are short, it’s better to focus on keeping the front torso long. Hunching into a forward bend isn’t safe for your lower back and does nothing to lengthen your hamstrings. Hold the final position for one minute. Then release your toes, bring your hands to your hips, and re-lengthen your front torso. With an inhale, swing your torso and head as a single unit back to upright. The full version of Vasisthasana, as taught by BKS Iyengar, with the top leg raised perpendicular to the floor, is beyond the capacity of most beginners. The pose described here is a modified version suitable for all levels of students. Vasistha = literally means “most excellent, best, richest.” Vasistha is the name of several well-known sages in the yoga tradition. There’s a Vasistha numbered among the seven (sometimes 10 or 12) seers (rishis) or lords of creation (prajapatis), and a Vasistha who’s author of a number of Vedic hymns. He’s also said to be the owner of the fabulous “cow of plenty,” Nandini (“delight”), which grants his every wish and accounts for his infinite wealth. Sit on the floor with your legs straight out in front of you, buttocks supported on a folded blanket. Bend your knees, put your feet on the floor, then slide your left foot under your right leg to the outside of your right hip. Lay the outside of the left leg on the floor. Step the right foot over the left leg and stand it on the floor outside your left hip. The right knee will point directly up at the ceiling. Exhale and twist toward the inside of the right thigh. Press the right hand against the floor just behind your right buttock, and set your left upper arm on the outside of your right thigh near the knee. Pull your front torso and inner right thigh snugly together. Press the inner right foot very actively into the floor, release the right groin, and lengthen the front torso. Lean the upper torso back slightly, against the shoulder blades, and continue to lengthen the tailbone into the floor. You can turn your head in one of two directions: Continue the twist of the torso by turning it to the right; or counter the twist of the torso by turning it left and looking over the left shoulder at the right foot. With every inhalation lift a little more through the sternum, pushing the fingers against the floor to help. Twist a little more with every exhalation. Be sure to distribute the twist evenly throughout the entire length of the spine; don’t concentrate it in the lower back. Stay for 30 seconds to 1 minute, then release with an exhalation, return to the starting position, and repeat to the left for the same length of time. 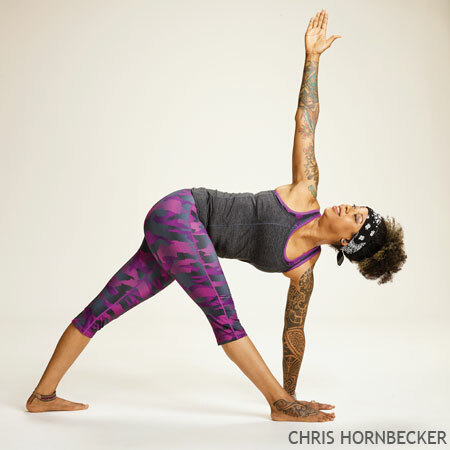 Watch a video demonstration of this pose.